THE EMBALMER (1966) Maureen Brown, Gin Mart, Luciano Gasper, Anita Todesco. A horrible fiend is on the loose under the streets of Venice. He pulls beautiful girls down into murky canals that catacomb the sewers of the ancient Italian city. He kills and "stuffs" them, then adds them to his grisly collection of mock-classic human statues that adorn the walls of his underground lair. A very cool Euro-chiller. From 35mm. 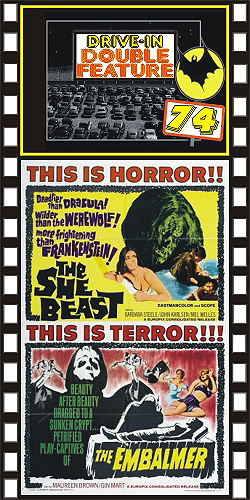 PLUS: THE SHE BEAST (1966) Barbara Steele, Ian Ogilvy, John Karlson, Mel Welles, directed by Michael Reeves. Villagers hunt down and drown an 18th century witch. Centuries later, Barb and her hubby vacation in the area. Their car crashes into the lake at the very spot that the witch was killed. Instead of Barb emerging from the murky waters, it’s the horrible witch, alive again and out for vengeance. Color, 16mm.